That man Tom Ford…you know, the one we all lust after whether for his good looks or his covetable, right-on collections past or present, is doing it again. Boy, does he understand women and how they tick. While we’re salivating for images and details of his SS ’11 collection, (pictures only available from January 2011, the very chic of the man), he’s only gone and developed a Limited Edition Black Orchid collection for Christmas and oh my, it’s sleek. Three limited edition products contain a pressed Black Orchid perfume, lip colour and nail polish, all in the deeply delectable, sultry Black Orchid colour. The best selling Black Orchid lip colour has been especially re-packaged in a signature black case with subtle fluting and gold lining. The slick packaging houses lipstick of the finest ingredients containing soja seed extract, Brazilian murumuru butter and chamolilla flower oil to create an ultra creamy texture and smooth application that has staying power. As a sidekick, the lush Black Orchid nail colour is a sheeny smooth, black/deep plum and is made for elegant vamps or disco vampires. The pressed perfume is housed in a slim black fluted compact just right for the teeniest Gucci, Fendi or Anya Hindmarch bags. Black Orchid fragrance intoxicates with its blend of rich dark floral accords with an alluring potion of black orchids and rich woody notes that swoop and dive over the senses. One bite of Black Orchid is all it takes to seduce. The black and gold casing breathes ’70’s ‘Studio 54’ elegance, perfectly in keeping for all those up and coming ’70’s trends for S/S ’11 just seen in the New York, London and Milan catwalks shows. Talking of which, Mr Ford’s as yet unseen collection (apart by 100 of the world’s top editors and fashion directors) concentrated on his trademark black and is rumoured to contain sharp pantsuits in a black silk or a leopard pattern, gorgeous black evening clothes with sheer blouses, corsets and sophisticated accessories like hammered gold jewellery, sky high stilettos with ankle ties and seamed black stockings. Sounds yumilicious. 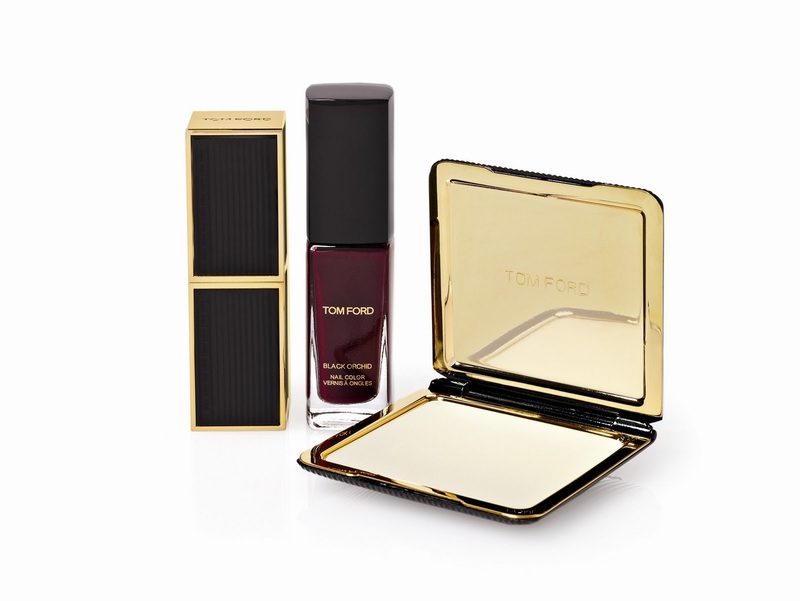 Undeniably Tom Ford chic . The Tom Ford Black Orchid Limited Edition Collection will be available in Harvey Nichols stores from 4th October 2010 and all Private Blend counters and Space NK stores nationwide from 1st December 2010 priced at £90.